Janet Wickell. The Spruce Crafts, 2015. Arrow Crown is a large quilt block pattern that finishes at 24"square. Its large size makes it suitable for bed quilts, and it looks good in either a straight setting or when placed on point. 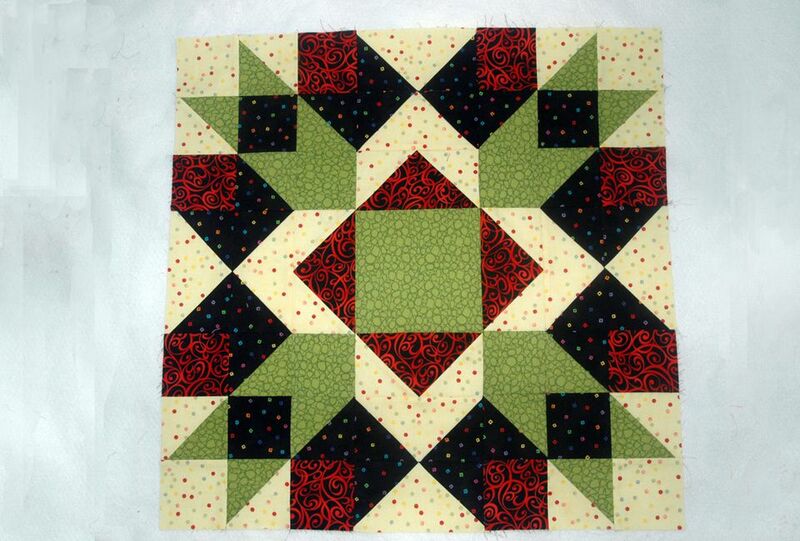 You may want to use one Arrow Crown block as a medallion center (border ideas for medallion quilts). Try this large block for any project, from table runners to large bed quilts. There are several ways to construct Arrow Crown. We'll use a combination of fabric squares, half square triangle units, and flying geese. Everything is quick pieced for easy assembly. Experienced quilters will see the other possible assembly routes. For instance, one alternative would be to replace flying geese with half square triangle units. Another switch would be to use quarter square triangle units to replace the geese that 'point' at each other around the edges of the block. Here the fabrics have been named A through D. If you plan to use more than four fabrics, read through the entire pattern before beginning to determine which pieces should be altered to make the change. Arrow Crown can appear very different, depending on the placement of color and color value (contrast). Love 3D-look quilts? You can achieve that look with Arrow Crown. See page 5 for a block sewn in entirely different colors. Some fabric is cut in very similar sizes (and for different purposes). Label fabrics to keep from grabbing the wrong pieces as you sew. *Cut slightly oversize squares for half square triangle units, and then trim back the completed units to their exact, unfinished size before sewing them into a quilt block. Sure, it's an extra step, but one that improves accuracy tremendously. Trim-back instructions are included in the tutorial linked on page 2. **Do not cut oversize squares for flying geese. ***Change half square triangle unit cutting sizes to use a different assembly method. The units must finish at 3" x 3" (in other words, measure exactly 3-1/2" x 3-1/2" before sewing them into the block). Arrow Crown is sewn with two types of flying geese. You'll make two no waste 'sets' of the same fabric combo (eight total geese) and one 'set' of another fabric combo. Refer to How to Make No Waste Flying Geese, if you have not used the method. Find the eight black Fabric B 3-7/8" x 3-7/8" squares reserved for flying geese. Draw a diagonal line from one corner to the opposite corner on the reverse side of each. If you cut oversize squares for half square triangle units, take care NOT to use them in flying geese. Find one of your Fabric A light dotted 7-1/4" x 7-1/4" squares. Refer to the tutorial linked above. Sew four dark squares to one large square as explained. Small squares are sewn two at a time, so don't neglect instructions. The result will be four flying geese that measure 3-1/2" x 6-1/2". Repeat with remaining large A square and four more 3-7/8" B squares to make four more flying geese. Use the same technique to make four more flying geese of the same size. Construct the geese with the 7-1/4" x 7-1/4" Fabric C red square and four 3-7/8" x 3-7/8" Fabric A dotted print squares. Refer to How to Make Quick Pieced Half Square Triangle Units for instructions. Follow the instructions in the tutorial to make the following half square triangle units. Pair four 3-7/8" x 3-7/8" (or oversize) Fabric B black print squares with four same-sized Fabric D green print squares to create eight half-square triangle units that measure 3-1/2" x 3-1/2". Pair four 3-7/8" x 3-7/8" (or oversize) Fabric A light dotted print squares with four same-sized Fabric D green squares to create eight half-square triangle units that measure 3-1/2" x 3-1/2"
If you used oversized squares, refer to the last page of the tutorial for trim back instructions — trims must be handled with care for units to work correctly when it's time to sew. Refer to the illustrations as you assemble the quilt block. Keep in mind that graphic assembly drawings do not include seam allowances, so your patchwork will look just a tiny bit different in scale. Place similar patchwork (flying geese and half square triangle units) in groups nearby. Arrange all pieces of the block on a design wall or other flat surface before sewing anything together. Taking that extra step not only helps you make sure that pieces are placed correctly in the layout — it also allows you to change the design. You might find that you like the layout better if you twist some of the flying geese around. For instance, how would your quilt block look if you turned the red/light geese around, with the red 'point' facing the block's center square? What about other geese? Experiment with the layout as much as you like before sewing. See page 4 for two variations created by merely flipping the flying geese. Arrange components into three rows as shown, top left drawing. Double-check to be sure all half square triangle units are oriented correctly. Press seam allowances in the top and bottom rows away from the center and press allowances in middle row towards the center. Join the rows. Press new allowances towards the top and bottom rows. The patchwork corner should measure 9-1/2" x 9-1/2". Arrange the flying geese into three rows as shown in the third drawing from the left. Sew the rows together — Press seam allowances towards the center flying geese unit. Seams can be very bulky when pressed towards two flying geese with peaks that meet. Press those seams open if you wish, although doing that is a trade-off — you may find later that it's more challenging to match seams that are pressed open with their neighbors. The new patchwork unit should be 9-1/2" tall and 6-1/2" wide. Sew the three parts of each row together. Press new seam allowances in the top and bottom rows away from the central (midpoint) unit. Press new allowances in the center row towards the large center square. Join the rows. Press. The quilt block should measure 24-1/2" x 24-1/2". Just two examples of variations you can create by flipping around some of the Flying Geese in an Arrow Crown quilt block. Mary Jane Cardwell made this lovely Arrow Crown quilt block in entirely different colors. Four patch quilt blocks that finish at 4" x 4"— six for two opposite sides of the quilt and eight for the remaining two sides (unless you use plain squares or another block at the corners). Four patch quilt blocks that finish at 6" x 6" would have squares that mesh with the block's intersections, but would probably be a bit large for a first border. Flying Geese, either sewn lengthwise around the quilt (vertical orientation) or sewn horizontally. Geese finishing at 3" x 6" would work, and so would 2" x 4" geese. A completely scrappy border sewn in fabric strips of varying widths. Consider how each border you add will affect the dimensions available for the next border. How about sewing a plain narrow border around the block first, to act as a frame? Consider the finished size before you sew, to make sure the new block size will work with planned borders. For instance, a framing border that finishes at 1-1/2" (use 2" wide strips) would increase the block's size by 3" — to 27" square. A 27" square block could be framed by 3" x 3" nine patches, or any block that finishes at a dimension that can be evenly divided into 27. Square-in-a-Square blocks that finish at 3" x 3" would work, too. You could place plain strips of fabric between blocks to make the final border dimensions work with 27". The choices are endless. Start thinking about the types of borders you think would suit the block (and your fabric choices).